BMW's 12-cylinder Hydrogen 7 isn't exactly the ultimate driving machine, considering it takes nearly 10 seconds to get from zero to 60 mph (laugh it up, Volkswagen Rabbit). But that's only a small concern, considering this 7's only true competitor is an airport shuttle bus built by Ford. The BMW (and Ford's shuttle) are the first vehicles on the road built to run on liquid hydrogen, whose combustion in a traditional V8 emits only water vapor and nitrous oxide, with a side of carbon dioxide. Wired News tested the Hydrogen 7 in Germany, and relays the details. The economies of usage don't exactly jibe; currently, it costs far more to drive the same mile in the Hydrogen 7 as it does in its dino-juiced counterpart, mainly due to the high price of hydrogen fuel at the retail level. 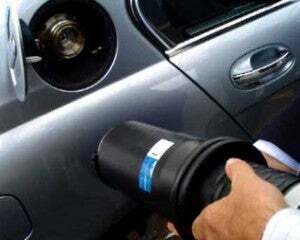 Plus, the process of extracting hydrogen from natural gas produces more C02 emissions than the car. But particulars aside, it's interesting to see carmakers pursue hydrogen combustion, which may wind up proving how the "hydrogen economy" will be impossible without a corresponding resurgence in nuclear energy. Maybe that's their intent.